One of our sportier jackets, Stealth Textile Jacket was designed for those who like speed. 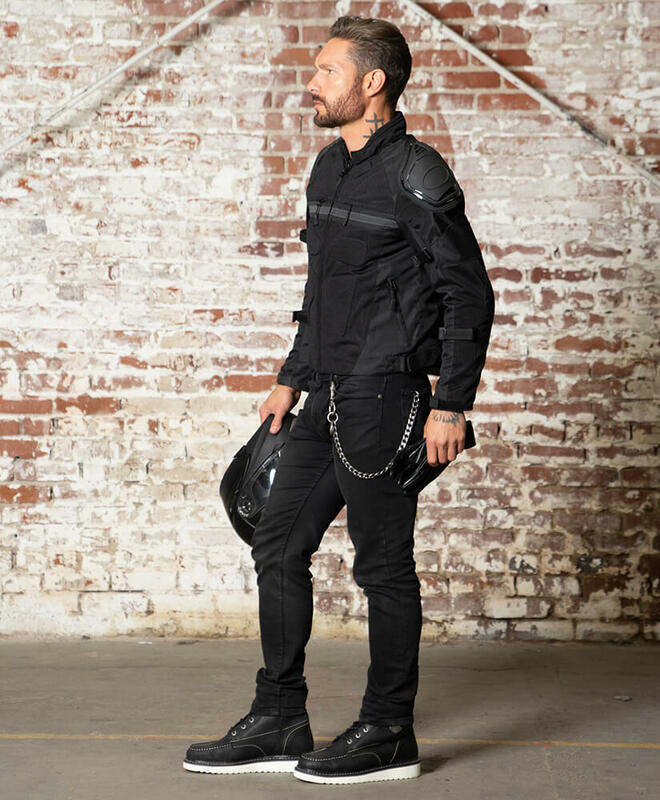 The jacket is built around the core idea of protection, with CE-level removable armor on elbows, back, shoulders and chest. The jacket comes equipped with our signature air flow system with zippered vents for controlled airflow. The jacket has a number of storage pockets including 2 external side pockets, a ticket pocket on sleeve, and a number of internal pockets including dedicated phone, knife and glasses pockets. The bike also has an internal zippered storage compartment large enough to store an iPad (or conceal carry) and a secret pocket. The jacket is also equipped with our headphone wire system to keep you connected while keeping the wires out of the way. For insulation, we have added a removable thermal liner so you can stay warm on cold riding days.